A love for fishing coupled with a fascination with fine wooden objects made the perfect backdrop for the birth of Big Blackfoot Nets. 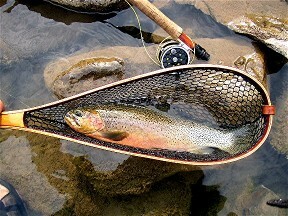 The image of a fisherman with hand-crafted bamboo rod in hand, sliding a wild cutthroat into a cheesy net just doesn't do justice to the fish or the experience. Now alter that image, replacing the net with one personally designed by the fisherman, a glowing work of art crafted from a myriad of exotic woods with a soft, fish-friendly netting. Feels better already, no? That's what Big Blackfoot Nets is all about. Design your own personalized net right here on this website in the comfort of your own home. In just a few weeks, it'll be in your hand or hanging off your back in the middle of your favorite fishing water. 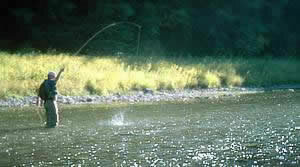 Our nets can be found on some of the world's great fishing waters, but they won't be found in any stores. We only make nets to order, and we make 'em one at a time. We like it that way. We're nestled in Montana's remote, historic Nine Mile Prairie valley, on the banks of the legendary Big Blackfoot River. The area is rich in history, both ancient and recent. The great Glacial Lake Missoula floods of 12,000 years ago helped carve the many red rock cliffs found in the area as well as the rolling boulder-strewn native grassland valley floor. 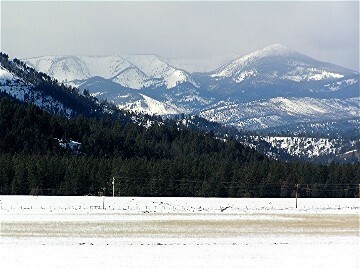 For many centuries, the valley was traversed by the Kokalahishkit Indian trail, heavily used by many western tribes to reach the vast buffalo herds to the east. Traces of the Indians' travois tracks can still be found in the area, including some running across our north pasture. Two centuries ago, this trail was used by Meriwether Lewis as the Lewis and Clark Expedition made its return trip to St. Louis. On July 5, 1806, Lewis and his band shot an antelope for lunch nearby. The vista onto which they gazed during that meal is now our backyard, and it has changed little since that time. It was another twenty years before the next European set foot in the valley, this being the legendary Jim Bridger. He spent the summer of 1826 in Ninemile Prairie, trapping beaver while somehow avoiding the loss of his topknot to the local residents, the Blackfeet Indians. More recently, this valley - and the river running through it - formed much of the backdrop for Norman McLean's beautiful novella and Robert Redford's subsequent movie "A River Runs Through It". This elegant tribute to fly fishing and to the Big Blackfoot River is continued in the name and design of our nets. Made one at a time right here in our shop, each net is custom built to the owner's specifications. We feel each one carries a bit of the mystique of the river and the land that surrounds its birthplace. click here to visit our partner business, TheCyberSafe - "The Gold Standard in Personal Home Inventory Protection"